This is a presentation on science PLD, given by Sabina Cleary of the University of Canterbury at the Building future-oriented science education in Aotearoa New Zealand conference in October 2014. Building a future-oriented science education system: Are we nearly there yet? This was the keynote presentation given by NZCER senior researcher Ally Bull at the NZCER conference, Building future-oriented science education in Aotearoa New Zealand, held in Wellington on 21 October 2014. Science for citizenship is the goal for science in t he New Zealand Curriculum. Ally looked at how well we are doing and where the challenges and disparities lie. These notes accompany the presentation by Ally Bull, called Building a future-oriented science education system: Are we nearly there yet? This presentation was given at the NZCER science conference in October 2014. This working paper sets out some of the early findings from a pilot project to explore the qualities that future-oriented teachers might need and how those qualities might be developed. The work began under an NZCER project called Back to the Future and is now part of a TLRI-funded project called On the Edge: Shifting Teachers' Paradigms for the Future. This report presents indicative findings from the first phase of NZCER's evaluation of Positive Behaviour for Learning (PB4L): School-Wide. It describes the extent of implementation of School-Wide in schools, identifies short-term shifts for schools that joined the initiative in 2010 or 2011, and discusses enablers and barrier. The findings suggest that overall, PB4L: School-Wide is well-regarded in participating schools and is linked to a wide range of changes for schools, teachers, and students. This is the first report from a new initiative called TLRI Project Plus. It aims to add value to the Teaching and Learning Research Initiative (TLRI), which NZCER manages on behalf of the government, by synthesising findings across multiple projects. This report focuses on two projects in statistics education and explores the factors that contributed to their success. This exploratory study considers the feasibility of measuring the "international capabilities" of New Zealand students in Years 12-13. 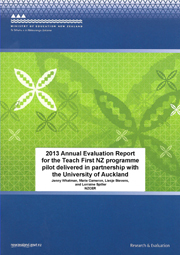 The work was done by NZCER for the Ministry of Education and is available on the Education Counts website. There is more information here to help school understand and develop their students' international capabilities. This page has moved - click here to go to the new page about Curriculum for the Future. This evaluation aims to understand how well the Teach First programme has been implemented and to what extent it has achieved its objectives. 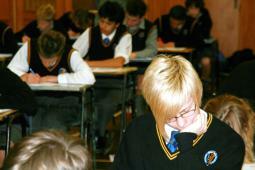 It is the first phase of a four-year independent evaluation commissioned by the Ministry of Education. This report explores the achievement of school leavers from state and state-integrated boys' schools. The analysis from 2010 to 2012 shows school leavers from state boys’ schools had higher qualifications than their male counterparts who attended state co-educational schools. 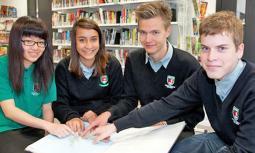 The research was carried out for the Association of Boys’ Schools of New Zealand.